Social media changes so much in a week that it can be hard to keep up. 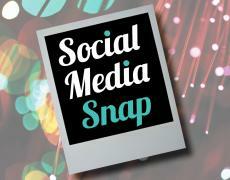 Check back every Friday for our roundup of social media news we think you should know about. Welcome to the first Social Media Snap of 2014! Find out what’s kicking off the New Year in the social media world. Recently, Twitter announced that users will now see an automatic preview of images tweeted by users they follow rather than having to click on the Tweet or link to see the image. This change makes Twitter a lot more image-friendly, a necessary adjustment since social media has been trending towards more image-sharing platforms. Email marketing platform Constant Contact shares with us how small businesses can use the new, image-friendly Twitter to enhance their marketing efforts. There are a whole lot of people using social media these days. Which means there’s a whole lot of data on those people. Recently, both Facebook and Pinterest took big steps toward sorting through their big data in order to better understand their users and improve content and promotions based on individual users’ interest. This can help not only the consumer enjoy their social media experience more, but also help organizations and brands get their content in front of the right users. News reports have come out recently taking a closer look at “click farms” or organizations from which companies, celebrities, politicians, etc. can purchase Facebook likes, Twitter followers and YouTube views. Time did a great piece about this growing industry and how social media platforms are responding to it. A new study has found that consumers are becoming less trusting of Facebook, Google and Twitter. The study’s results could have a major impact on legislation surrounding online privacy, policy changes at social media networks, and how companies are able to access and use consumer data gathered from social media. Trying to analyze your Tweet’s reach and engagement is not easy, especially compared to Facebook’s analytics. In an effort to improve its analytics, Twitter created the new @AchievementBird account to help users understand how their Tweets perform. According to Tech Crunch, once you’re accepted as a follower of the account “[it] will occasionally send you messages about how one of your tweets has performed”. I’m looking forward to watching the progress of @AchievementBird and Twitter’s analytics capabilities as a whole. This week, Facebook announced that as of April 9th it will no longer feature sponsored stories on its site. A sponsored story is a post that is displayed on a user’s newsfeed when a friend interacts with a sponsored page, app or event and the organization has chosen to promote those interactions. This change is part of Facebook’s larger effort to bring higher quality, more individualized content to users’ newsfeeds. Happy Friday and go Broncos!